Marilyn Monroe was the stage name of Norma Jean Mortenson, a 1950s/60s actress whose image transcended her day job; she married famous names such as Arthur Miller and Joe DiMaggio before taking her own life in 1962. Anything produced in tribute to Monroe is welcome and this online slot from Playtech is a worthy diversion. Being the slot machine pedants that we are, we can’t help noticing that some of the design of the game seems to owe a little to the 1920s and 1930s rather than Monroe’s period but don’t let that put you off. There are five reels and twenty paylines with the basic symbols being Playtech’s standard playing cards; the more valuable symbols are a walk of fame star, magazines with Monroe on the cover, a movie camera and a couple of different Marilyn poses. A third Marilyn is the wild symbol and the scatter is a neon Marilyn Monroe logo. The backdrop to the game is skyline at night. There’s only one bonus game but it can be a lucrative one; you will have to land three or more of the scatter symbols anywhere on the reels and this will win you ten free games with 2x multiplier to start. Before that round begins you also get to choose two from five pictures of our heroine which will reward you with more free spins and multipliers; what’s more, if you can spin another three scatters within the bonus round you’ll be awarded an amazing 35 more free spins. That means that there’s a lot of money to be made in the bonus round so it should be your focus. We wouldn’t normally write a separate paragraph for a wild symbol but if you manage to land the stacked Marilyn on the reels you’ll see why it’s worth a mention. Marilyn is revealed in all her dress-blowing-up glory and there’s a certain portion of the slot-playing demographic who may like to linger here for a while. 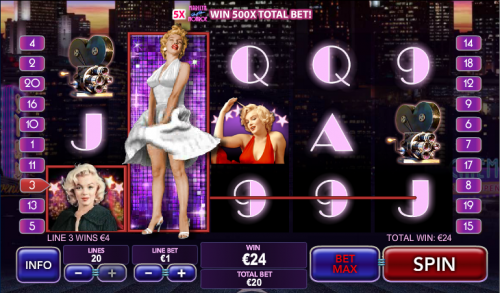 Marilyn is an evocative game with an entertaining and profitable bonus game and a fitting slots-based tribute to one of the film industries greatest icons – give it a whirl!